The Mount Saint Mary College women's basketball team fell to the Old Westbury Panthers, 73-69, in their Skyline Conference game Sunday, February 23, 2014 at the Kaplan Center in Newburgh, NY. 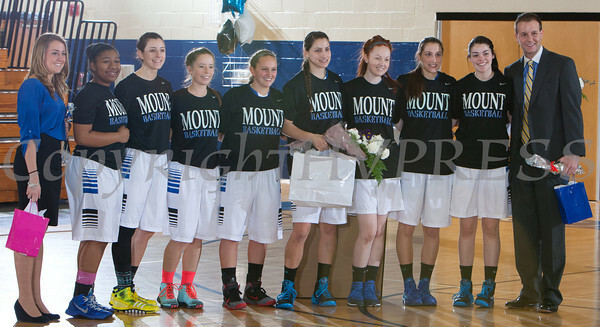 The Mount Saint Mary College women's basketball team poses for a picture on senior day with assistant coach Christina Jordan (far left) and head coach Michael Coppolino (far right) on Sunday, February 23, 2014 at the Kaplan Center in Newburgh, NY. Hudson Valley Press/CHUCK STEWART, JR.